The frame "Structure" allows to input the dimensions of the pile cap according to the defined scheme, number of piles (micropiles), their diameter and spacing. If defined pile cap shapes are not satisfactory for the pile group geometry input, program allows to enter general shape of pile group. General shape of pile cap is entered by coordinates of points, but it is also possible (by pressing the button "Generate general shape") to generate coordinates of structure from already input predefined pile cap. If the general shape of a pile cap is selected, it is possible to input inclination of piles α. This option (α ≠ 0°) is available only for spring method, not for analytical solution. For analytical solution all piles are considered as vertical (α = 0°). So, for calculation of vertical bearing capacity or settlement of pile group an inclination of piles is not considered. 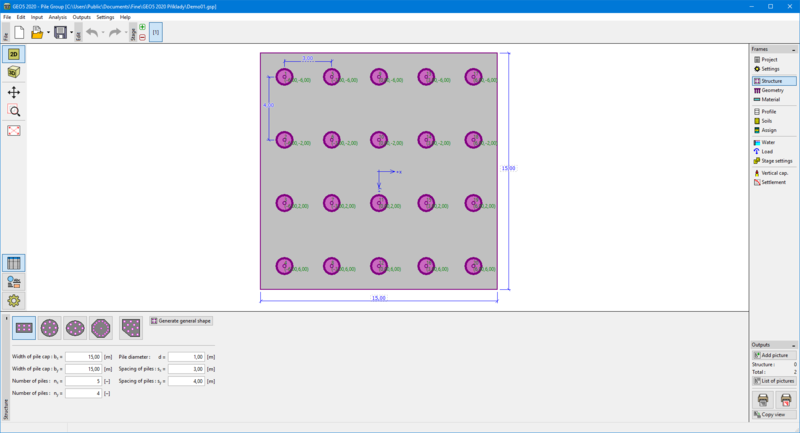 The program allows to export the geometry of the structure in *.DXF format.